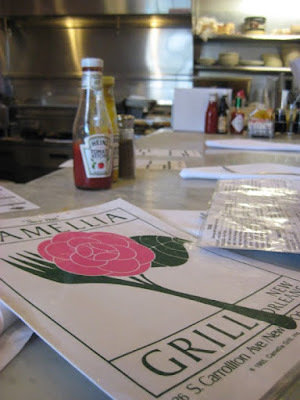 Camellia Grill is as old school as they come - a twisty formica counter in front of an open kitchen slinging excellent diner standards. 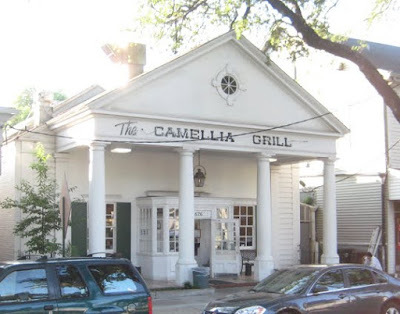 On the evening of our whirlwind New Orleans food Odyssey, our kids were getting a little tired of unfamiliar foods, and Tracy suggested we check out Camellia Grill for some tried and true diner basics. Normally the getting there doesn't merit a mention, but this is an exception. To get to Camellia Grill from the French Quarter, you walk a block or two down Canal Street to the first stop on the St. Charles Streetcar line. You pay your $1.25, choose one of the smooth old wooden seats, settle in next to the breezy, wide open windows, and off you go. It's about a 30 minute ride through downtown, past the stunning Victorian mansions in the Garden District, between Tulane and Audbon park, and around the Carrollton curve to a stop under giant trees, right across the street from Camellia. As good as it was, this was not the best burger I've ever had. But it was the best transportation I can remember. The second thing to mention here is the absolutely out-of-hand gorgeous white Greek-revival building, columns and all, that houses Camellia. It's a lovely structure, looking far larger than the tiny little table-less restaurant you encounter walking in the front door. To eat at Camellia is to eat at one of the 22 seats at the bar, which bends around the kitchen in a sort of squared-off W formation. This is redefinition of open kitchen - this is kitchen as entertainment. Tracy and the girls all got waffles. Tasty, but nothing too special, these were old-style relatively flat waffles vs. the current Belgian waffle standard. Not to be a sucker for trends, but I prefer the crisp lightness of a good high Belgian waffle, to the sort of pancakey variety served here. Still, it was tasty, and along side the waffle came a giant hopper of melted butter and another of syrup. Melted butter rights most wrongs, and it was a nice touch here. 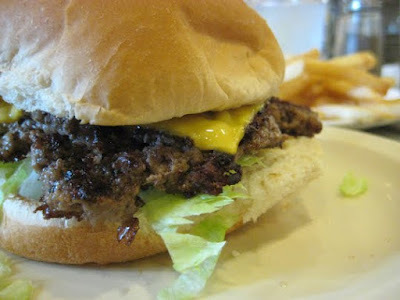 The burger was better - fresh toppings, and a loose, tender burger on fluffy white hamburger bun. Nothing fancy or trendy here either - just lettuce, tomato, grilled onions and pickles, and a nicely juicy thin hamburger patty cooked up under a press on the flat top. Had Camellia been a roadside stop in some random strip mall, lined with booths and faux woodgrain tables, serving exactly the same food, it'd be nice little neighborhood joint, no different than thousands like it. But the experience of this place, the history, the streetcar, the big columns, the mushroom barstools, make this place one-of-a-kind and totally extraordinary.